We are fully open now at our Temporary Location: DRIVE AROUND THE BLOCK BEHIND OUR BECK AVE STORE! 1314 Bayview Ave., Panama City, FL 32401. Our hours are 8AM to 5PM Monday through Saturday. We now have a full selection of inventory to choose from, so stop by and check us out as you are restocking your electronics, tools and other items, and when selecting Christmas gifts! We now also have full access to all pawns and layaways from BOTH STORES. We started pulling defaulted items on December 1st. If you wish to save your items, please call or stop by to make a payment right away. We can take payments over the phone, for your convenience. Thank you to our wonderful customers who have called and come by the new location! We appreciate your loyalty and patronage. Our Dan's Pawn staff continues to work incredibly hard to provide you with the best selection and personalized customer service that makes us your favorite pawn shop! 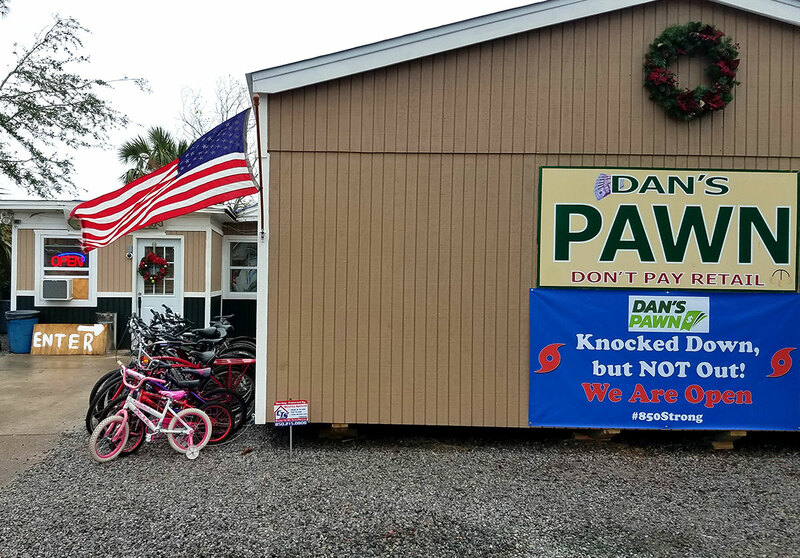 Hurricane Michael Update 11/1/18 - Dan's Pawn did a soft opening, combining both stores into one, on Thursday November 1st 2018. We are now operating at 1314 Bayview Ave, directly behind our previous location on Beck. You can simply follow signs around the block to find our new store. Our new store hours are 8am-5pm. Our phone lines are back up and running, so feel free to call us at 850-747-0011 or 850-785-7763. We have full access to the computer systems for both of our stores so we can look up any pawn, take payments & give extensions. Our credit card machines are up and running as well, so we can take credit/debit payments in person or over the phone. We saved and have complete access to all of the jewelry(Pawns & Layaways) from both stores, so come on in and pay on it, pick it up, etc. We have a full line of jewelry FOR SALE as of yesterday, and our prices are discounted more than normal. We just put our DVD & Blu-Ray movies out for sale with great selections and reduced prices. Give us a few more days, and we'll have TOOLS and GUITARS back out for sale as well. We are giving automatic 1 month extensions to everyone and we will not default anything until December 1st. Please call or come by to discuss and/or pay for your items. We are very proud to have reopened and look forward to serving as many people as we can in the coming weeks and months. We plan on formally opening on November 15th when we expect to have all merchandise consolidated into our new location. We know that times have been hard, and we are determined to rebuild and help ya'll. Call, click or come by... We're back in business! Hurricane Michael Update 10/26/18 - Due to Hurricane Michael, both of our stores have suffered heavy damage from the wind and storm surge. Our St. Andrews location had 1-2 feet of storm surge and the roof came off, allowing water to damage half of our merchandise and pawn loans. Our Springfield location was hit hard by Hurricane Michael's winds and about 60% of the merchandise was damaged. The Good: All of the jewelry pawns & layaways were saved, along with 90% of our tools and gas-powered pawn items. These items were transported out of harm's way before the storm, and will be returned shortly. The Bad: Unfortunately, most of the electronics merchandise suffered wind, water & heat damage, but we hope to save 10-20% of those items. There was some looting immediately after the storm, especially at our Springfield store, but we quickly placed armed security on a 24/7 watch at both locations. We are actively working to make our new temporary, Dan's Pawn St. Andrews, location safe and ready for all of our merchandise. Our temporary store is located directly behind the old St. Andrews store. We hope to be operational, at our temporary location, by November 1st, while our St. Andrews store is gutted and rebuilt. Our insurance company has done a great job helping us through this process. We have 22 vendors working overtime helping us save as much as we can, and restore our infrastructure. We've had a huge outpouring of support from friends, family and pawnbrokers from around the country. We have 14 of our original employees still here, which is plenty enough to get started... and hope to get the rest back shortly. Starting Saturday(tomorrow) 10/27/18 we will have all 14 phone lines from 3 locations forwarded to our Corporate Office. We have 900 important messages to return, so please be patient as we work hard to get caught up. Don't worry about your pawned items defaulting, because we are giving time extensions to everyone. We love you guys, and are heartbroken by what's happened to our community. With God's help and your support, we shall return stronger than ever. 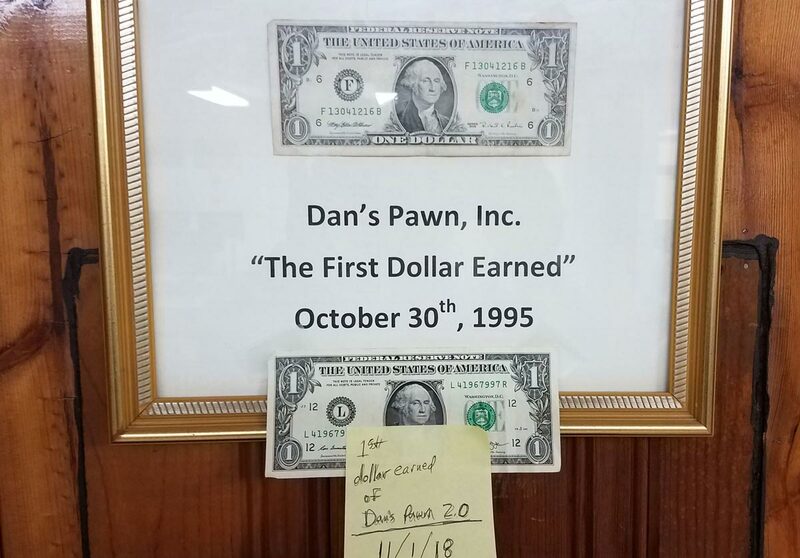 On behalf of your friends here at Dan's Pawn, we look forward to serving you soon. Tired of paying high retail prices? Then Dan’s Pawn is your solution! 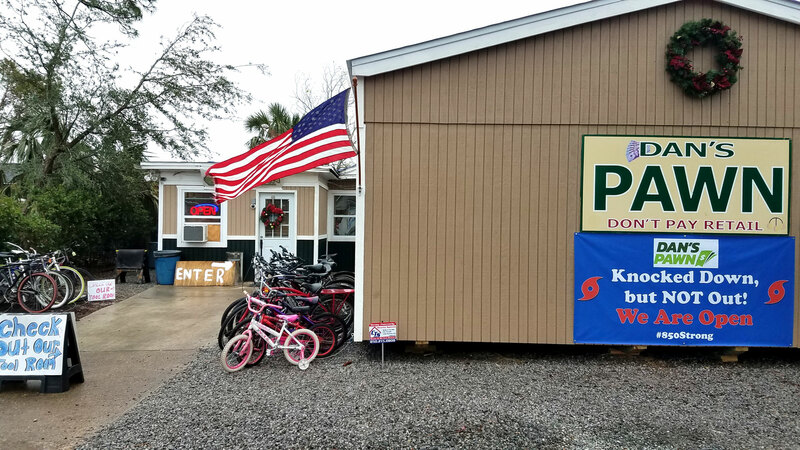 For over 20 years we having been providing Bay County with quality, pre-owned consumer goods at a deep discount. We have a huge selection of merchandise, everything from game systems to tools to jewelry; whatever you are looking for chances are we will have it. All merchandise is tested when we purchase or pawn it. If it defaults, we thoroughly clean it, and price it to sell (usually 1/2 of what it would cost NEW). Now the best part, virtually all of our items carry a 10 day guarantee! 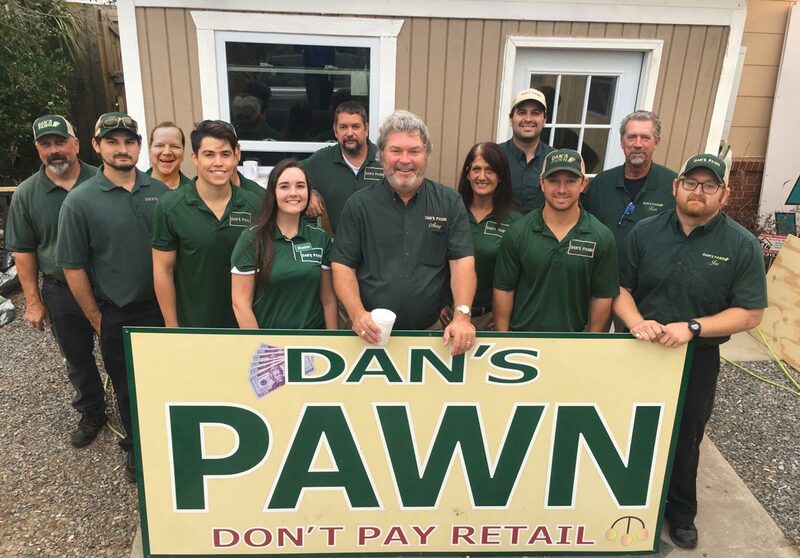 You can buy with confidence at Dan’s Pawn; we stand behind what we sell. Have you been to a jewelry store lately? The prices are astronomical! Since gold prices have gone up, it is more important than ever to shop around for jewelry. All of our jewelry is thoroughly cleaned (a 5 step cleaning process) and tested to ensure it is of the highest quality. We have jewelry from simple to extravagant, diamonds to emeralds, white gold and yellow gold. Do yourself a favor and check us out before you buy. 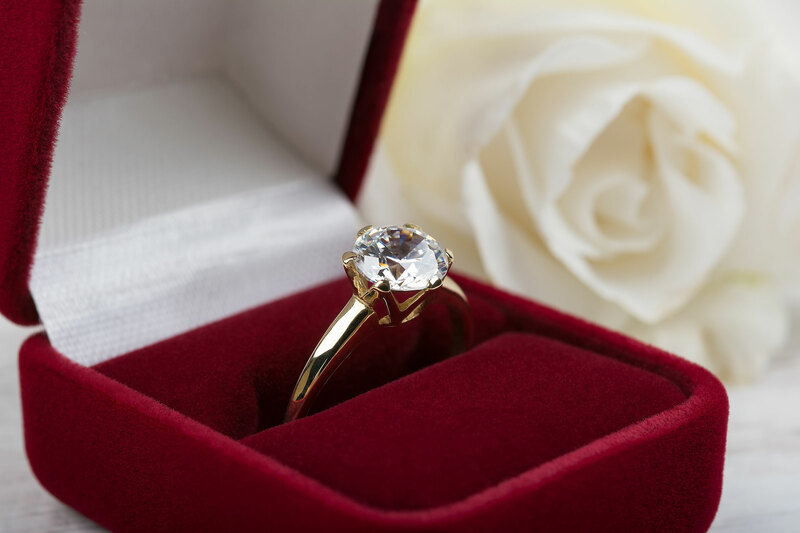 We can help you avoid the high markup (300-500%) found in most retail jewelry stores. We take virtually all forms of payment including; Visa, Mastercard, Discover, American Express, Debit Cards, and of course CASH.